Ethyl acetate is a highly flammable, colorless liquid with a fruity odor. The flammable chemical is slightly soluble in water and is slowly hydrolyzed by moisture. Ethyl acetate contains a flash point of 24°F and has vapors that are heavier than air. The toxic chemical can be easily ignited with heat, sparks, flames or other ignition sources. The vapors that this chemical gives off can form explosive mixtures with air. These dangerous vapors can travel to a source of ignition and flash back, leading to a hazardous situation. It is necessary to keep this chemical in a completely sealed container. Health hazards associated with ethyl acetate chemical storage include headache, dizziness, nausea, loss of consciousness and respiratory irritation. Proper personal protection is necessary when handling or storing ethyl acetate. Instability 0 Stable under fire conditions. The hazardous chemical ethyl acetate is used for many different applications including paints, cleaners, laboratory extractions, and as an ester in wine. It is commonly used in nail polish removers, solvents, perfumes, column chromatography and it is also used to clean circuit boards. Ethyl acetate is incompatible with oxidizing agents, strong acids, and strong bases, therefore it is necessary to segregate ethyl acetate chemical storage in a separate chemical storage building, away from incompatible materials, or segregated with a solid partition wall. Store ethyl acetate chemical storage away from direct heat or sunlight, in a completely sealed chemical storage building. Utilize safety accessories including mechanical ventilation and/or a cooling system. Keep ethyl acetate chemical storage away from moisture. Since ethyl acetate chemical storage is explosive, under certain conditions, it is necessary to use explosion proof safety accessories to remain safe and compliant. Compliantly store ethyl acetate chemical storage with a SUPERloc chemical storage building by US Chemical Storage. Ethly acetate chemical storage should be stored in a 4-hour fire-rated chemical storage building for maximum safety and security reasons, due to the nature of this chemical. The SUPERloc chemical storage building offers an extremely strong fire-rated construction for storing flammable and combustible chemicals safely. Optimize your chemical storage building with a wide variety of explosion proof accessories including explosion relief panels, lighting, outlets, electrical accessories, heating units, cooling units, mechanical ventilation, shower units, eye-wash units, and more. 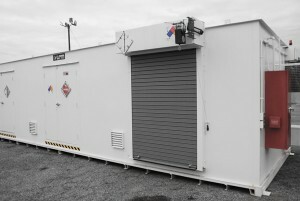 US Chemical Storage buildings feature a 15-year structural warranty and a built-in secondary containment sump for containing leaks, spills or hazardous accidents that may occur during storage. Contact one of our experienced sales engineers to learn more about how to keep your ethyl acetate chemical storage safe, secure and 100% compliant.